After a decade in business, how is Takashi holding up? This spring marks my 20th year of food writing in Utah. Where does the time go? Over the past two decades I’ve witnessed remarkable changes to the food scene here. I won’t recount all the restaurants and chefs that have elevated Utah dining during that time; I hope you know who you are. But I will say this: There isn’t a restaurant here that I’ve more consistently enjoyed eating at over the second half of those two decades than Takashi, which opened May 17, 2004. I encountered Takashi Gibo working at Shogun before he and his wife, Tamara, opened their own restaurant. It was obvious to me, even back then, that he had special skills. His attention to detail, his artfulness and precision, and his in-depth knowledge of flavor profiles in sushi-making was off the charts. And he couldn’t have been more friendly. Friendliness, enthusiasm and generosity are parts of Gibo’s winning personality. However, don’t think for a minute that he’s an owner who hovers in the doorway of his namesake restaurant glad-handing customers. Yes, Gibo is always ready with a warm welcome and bright smile for patrons who seek him out at his sushi bar. But he’s not about flash; he’s one of the hardest-working chefs I know, and also one of the humblest. Gibo is a torrent of energy; I used to wonder when and if he ever slept, until I stopped by the restaurant one day to return a book I had borrowed and found him grabbing a quick nap on a bench in the dining room between lunch and dinner service. Still, he deflects most of the praise that comes his way and redirects it to his excellent staff of fellow sushi chefs, cooks and servers when compliments come—which is often. As far as I can tell, there’s not a right or wrong way to “do” Takashi. I usually begin with lighter, raw foods like nigiri and sashimi, and work my way into the richer, cooked ones. To that end, I recommend an order of fresh oysters right off the bat as you digest the daunting menu. A trio of shigoku oysters on the half-shell ($9) is a colorful presentation incorporating miniature lemon slices, serrano peppers, julienned daikon, seaweed and a smidgeon of zippy red sauce. The flavor explosion would pair well with a signature Takashi shisohito—a refreshing cocktail of Kissui Japanese rice vodka with yuzu, lime, shiso leaf and cucumber. Next, I suggest asking Gibo or one of his team to recommend whatever fish is freshest and particularly unique that day—Takashi often has fish varieties you won’t find anywhere else around here—and have them make you a sashimi assortment: different types of raw fish, each usually topped with a distinctive garnish to enhance or complement the flavor. Gibo is exacting with his sauces and garnishes, most of which he makes from scratch. They might range from white soy sauce to a Peruvian-style ceviche sauce like aji amarillo, or Takashi’s signature tomatillo sauce that discreetly elevates the sea bream. 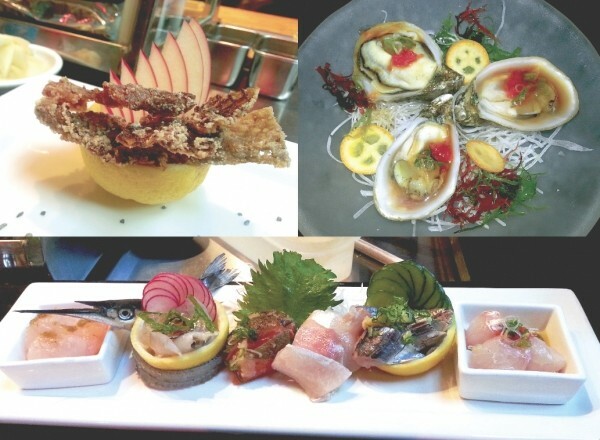 While the food at Takashi is serious, the menu is playful. Gibo loves music—especially the Beatles—and so you’ll find specialty rolls with names like Strawberry Fields ($8), Imagine ($14.95), Yellow Submarine ($11.50) and All You Need Is Love ($7.95). My favorite Takashi roll is the subtly flavored Ebony & Ivory ($15). It’s got beautiful, glistening white escolar topped with black tobiko (flying fish roe), with kampachi, Asian pear, shiso and spicy sauce inside. It’s a gorgeous flavor spectrum ranging from the salty tobiko and delicately flavored fish to sweet pear, citrusy shiso and tangy, spicy sauce—a superb example of Gibo’s creativity and his unmatched ability to create one-of-a-kind flavor combinations. During dinner, I’d certainly suggest an order of gyoza ($8.50), Japanese-style pork and cabbage dumplings made in-house with clean ginger flavors and served with spicy ponzu. Although it’s labeled on the menu as a “small plate,” there’s nothing small about either the portion size or the flavor of azekura: seared, tender Wagyu beef strips atop tempura-fried portabella mushroom slices and green beans, all bathed in Takashi’s top-secret essential reduction sauce ($10.95). As with the luscious ginger-soy glazed barbecued pork ribs ($9.50) and the Kuro Buta braised pork belly with Peruvian fusion-style saikyo miso and veggies, you don’t have to love raw fish to love Takashi. There is so much more to mention about the pleasures at Takashi: the superb service; the excellent beer, sake, wine and cocktail list; the snazzy atmosphere; even the remarkable mushroom panna cotta dessert (not a typo), made with candy cap mushrooms which lend a maple-syrup taste to the panna cotta. Outstanding. When I reviewed the then-new Takashi 10 years ago, I said that I felt it was on a par with America’s most renowned sushi restaurants. If anything, I feel even more confident in that proclamation today. In two decades of food writing, I’ve yet to review a restaurant that I’ve enjoyed more than Takashi.